Yesterday at the Stennis Space Center in Mississippi, NASA tested a rocket engine that will one day send astronauts to Mars. The RS-25 engine powers the Space Launch System (SLS), a giant rocket in development that's able to lift more, faster, than any rocket to come before. The test involved convincing the engine that the test stand structure to which it was mounted is an actual rocket. Conditions were then fed to the engine to see how it reacted. At yesterday's test (the sixth so far in a series), the RS-25 was run through a complete launch, blasting 512,000 pounds of thrust over a period of 535 seconds—the precise amount of time it would take to send a spacecraft into space. This firing's central objective involved testing a new controller—the engine's "brain." It was magnificent. The engine was like an inverted volcano. White clouds billowed forth at 13 times the speed of sound, blasting so forcefully that even its component water vapor seemed confused and alarmed. The sound was like a sustained, rolling thunder that you could feel in your teeth, and its timbre dominated even your pulse. The experience was truly awesome in force and effect. The power and fury of the test was terrifying—and yet the RS-25 is perhaps the most peaceful product of the space age thus far. It's not a weapon of war. It powers no ballistic missiles, nuclear or otherwise. It exists only for exploration and the betterment of humankind. The RS-25 has been around for decades now. Described as "the Ferrari of rocket engines," it was originally used as the main engine of the space shuttle. (The engine tested yesterday has already been to space and back.) Though it was designed for reusability, its use on the SLS will be a one-shot deal. As part of the rocket's core stage, it will be jettisoned after launch, falling back to Earth and into the ocean. Using a powerful, reusable engine in single-use conditions allows engineers to push the RS-25 much harder on the SLS than they might otherwise have done on the space shuttle. Reusable engines are much more expensive than expendable ones. But NASA already has 16 RS-25s that were pulled from the shuttle fleet and are just lying around in warehouses. Because the SLS uses four RS-25 engines per launch, that's enough for four launches. No matter what budget crunches NASA might face in the years ahead, those engines are ready to fly. The first SLS launch is slated for 2018. Meanwhile, the agency is working with Aerojet Rocketdyne, the company that designed and built the RS-25, to restart manufacturing the engine. Because of new technology and a single-use objective, the next batch will be designed with a goal of reducing costs by 30 percent. Despite the extensive real-world use of the engine, it must be fully tested before going back to space. NASA offers three reasons for the re-testing. 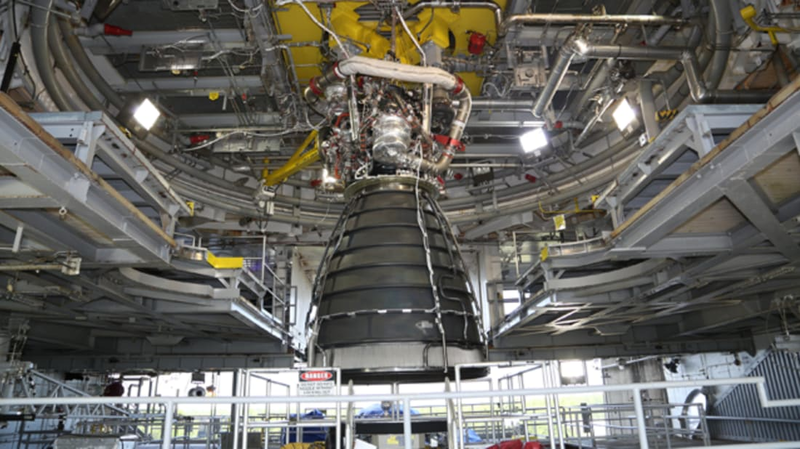 For one, the RS-25 engine will operate at 109 percent during SLS missions. (What stops the engine from going up to, say, 112 percent? "More testing," said one engineer. "It can be done.") But that extra 9 percent doesn't come for free. Propellant inlet pressures are higher; the propellant used by the rocket is colder; and the nozzles will be hotter. When you're talking about the biggest rocket ever—one that will eventually have people on top of it—tests are essential. When an RS-25 test is running, it gets slightly warm on the test stand—6000 degrees warm, in fact. The "smoke" seen during yesterday's test wasn't actually smoke; it was water. Thrust is created when liquid oxygen and liquid hydrogen are combined by the engine. Depending on the atmospheric conditions, tests historically have produced actual, heavy, manmade rainstorms from blue skies. "We've been making fire and rain for a long time here," said Ronnie Rigney, the RS-25 project manager at NASA. So how powerful is the RS-25? According to Aerojet Rocketdyne, if the engine were generating electricity instead of propelling rockets into space, it could power 846,591 miles of residential street lights. That's a street long enough to go to the moon and back, then circle the earth 15 times. Its durability is equally impressive: The engine begins a mission at -423 degrees Fahrenheit and climbs in temperature to 6000 degrees Fahrenheit, which is hotter than boiling iron—all in a span of 8.5 minutes. The public's visual of the space program generally begins with a spacecraft on the launch pad, but it takes decades of research and development to ever get there. "The first inch off the ground is the hardest part," said Todd May, the program manager of the SLS. "We are now at a place where we are done with the design of SLS." In 1985, the test stands at Stennis were designated National Historic Landmarks for their crucial role in the Apollo program, which put humanity on the moon. The stands have been used to test every engine used by NASA since. If the space program continues its present trajectory, they will prove key in putting Americans on Mars as well.